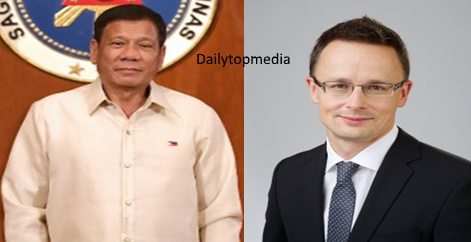 Despite criticisms from the EU calling on Duterte administration to drop the anti-drug war campaign, A top diplomat from the Hungarian government and a member of the European Union (EU), vowed it will not meddle in the internal affairs of the Philippines. According to Hungarian foreign and trade Minister Peter Szijjarto, in an interview said it will never “judge or criticize” the country’s leader, President Rodrigo Duterte, who was elected by the people of the Philippines. “Actually, we are a country which never comments on internal and domestic issues. We understand that it’s only Filipino people who have the right to make a decision about who is leading this country and as we expect others not to judge and criticize our domestic and internal developments, we will never judge and criticize internal developments of other countries,” he said. Szijjarto was the first foreign minister from 28-country EU to visit the Philippines, particularly Davao City.